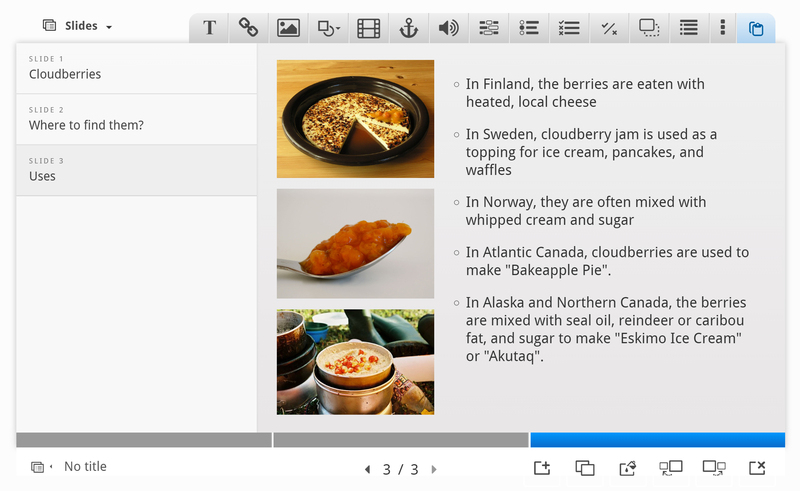 The Course presentation content type allows you to create a slide-based presentation of your learning material. 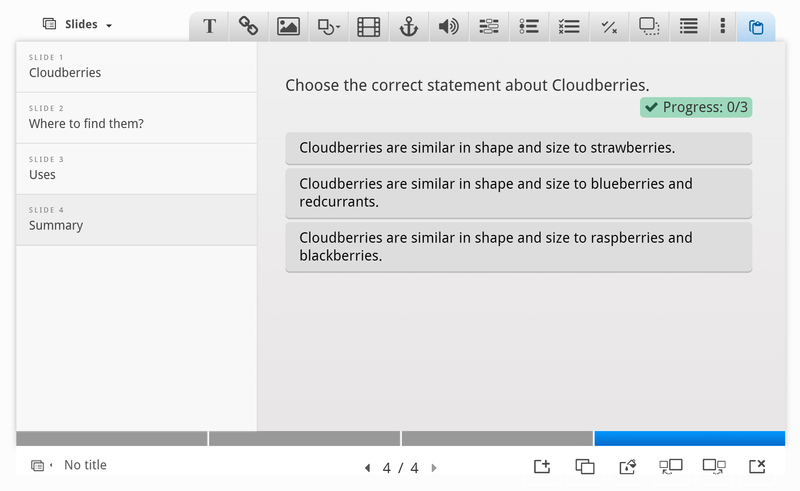 Elements such as slide titles, links, pictures, audio and video clips, as well as various quiz types can be embedded seamlessly right into the presentation for a richer learning experience. Course presentations enables you to author and deliver your course material directly in your browser. Course presentations contain slides where you can add various multimedia- and interactive elements to engage the learner. Course presentations are used when you want to package a piece of learning content in a structured and interactive format. Learners swipe through slides to experience the learning material, while solving various quizzes or watching videos along the way. Try Course presentations as an alternative to presenting your learning content as Powerpoint presentations, PDFs or text-based web pages. Course presentations are very flexible to use, as they are simple to create, publish and edit. If this is the first time you are using H5P, you should start off by reading this guide to ensure you are up and running with H5P on your platform. Alternatively, you can test drive H5P right here on h5p.org and skip to step 1. Navigate to the menu that enables you to create new content. In Drupal, you select Interactive content. 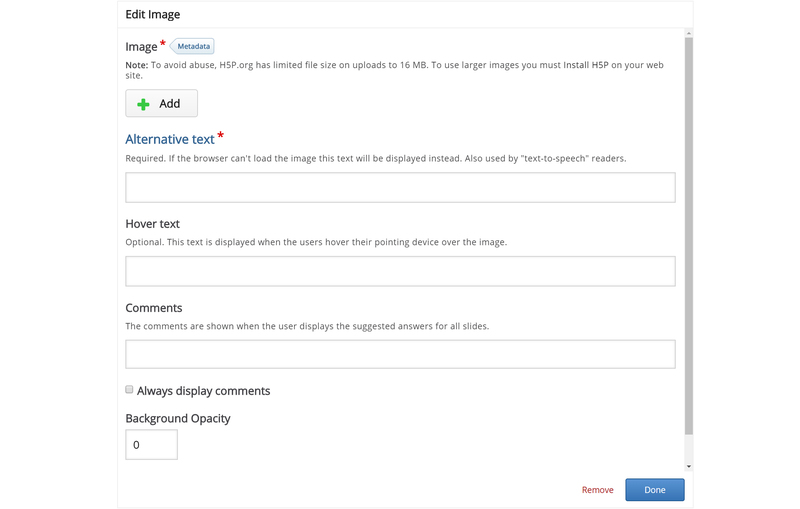 In WordPress you press Add new under H5P Content in the admin menu. Select the Create option for H5P. If you find Course presentation in the list of Content types, skip to Step 1. You will now find Course presentation in the Content type list when creating a new H5P. We'll use the Wikipedia article about Cloudberries as background material for our Course presentation. We'll use a couple of pictures from Wikimedia Commons as well. Slide 2: Where to find them? Head over to where you usually create new content on your platform. 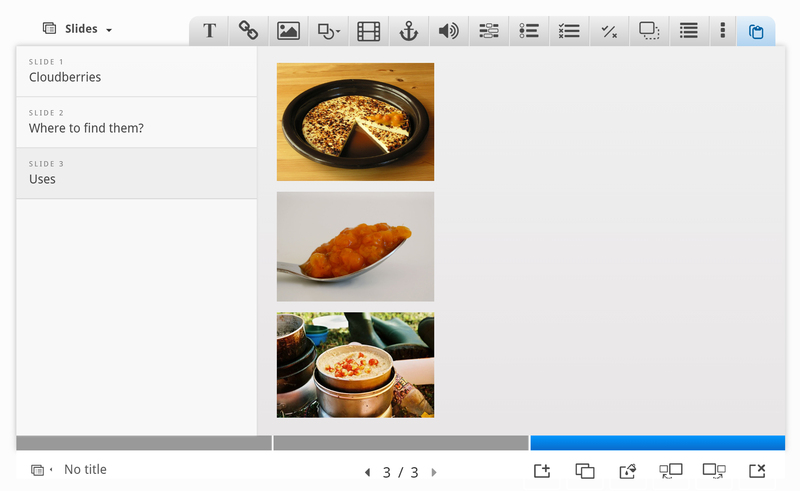 In Drupal you go to Create content and select Interactive content. 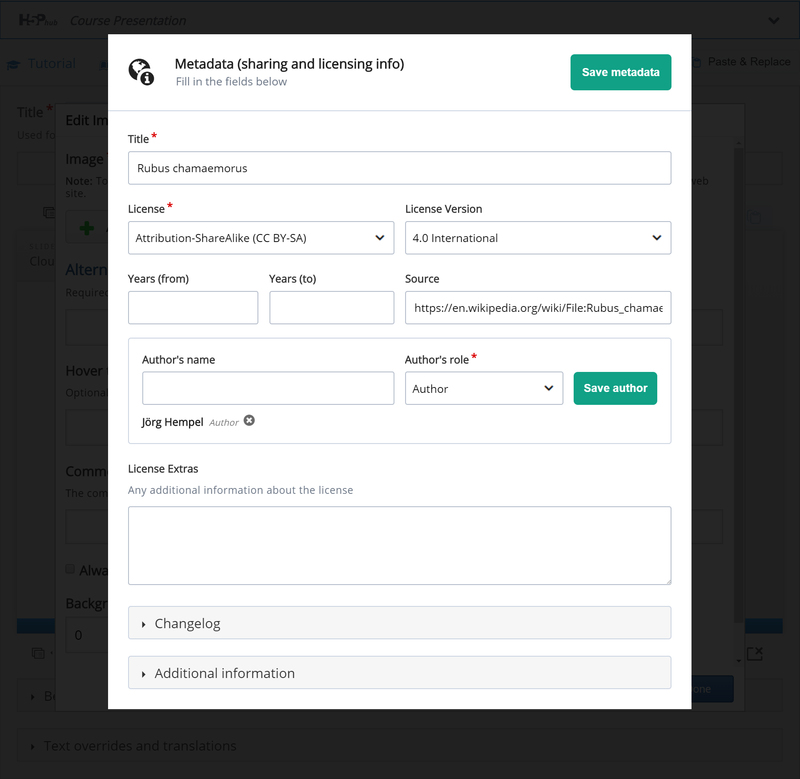 In WordPress you select H5P Content and Add new from the admin menu. Then select the Create option for H5P and choose Course presentation from the list of Content types. 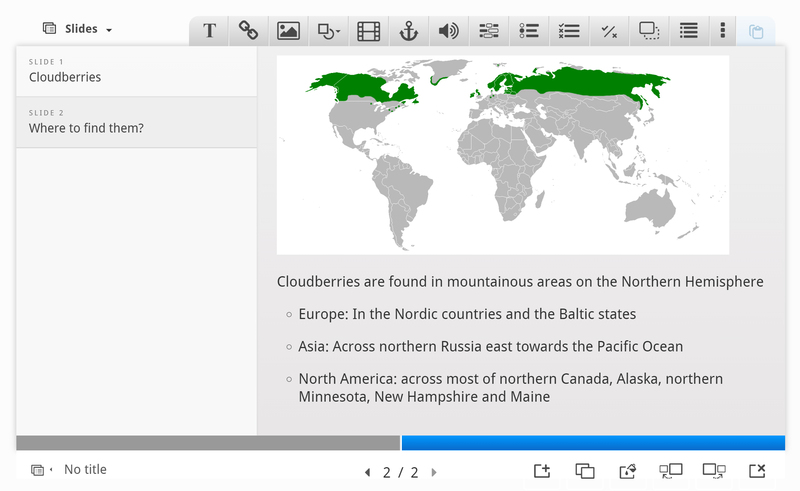 In this tutorial, we'll focus on creating the Course presentation content. The content creation happens in the top part of the editor, so we'll only focus on this for now. The Course presentation editor is WYSIWYG. 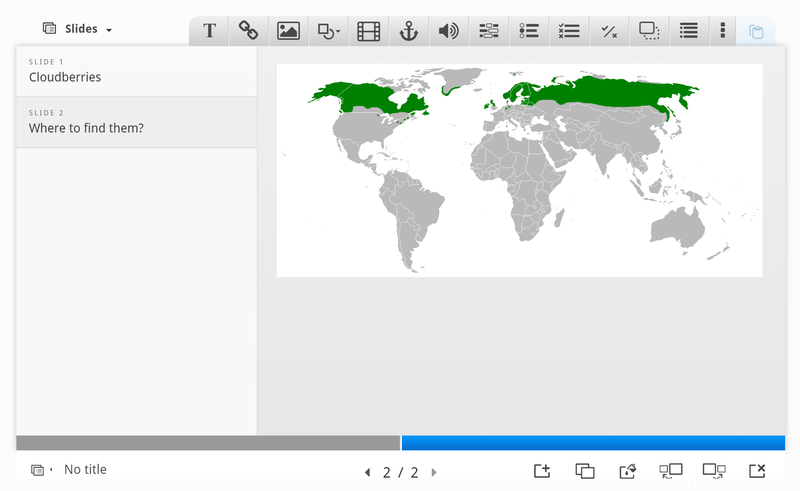 The end user view of the Course presentation will look very similar to the editor view. We'll start by adding a slide in the slides panel to the left. The slide titles can be used to navigate between the slides. You can remove the slides panel entirely by pressing the Remove slides button. However, this action cannot be undone. Press the button to open slides menu. Press the pen next to "No title" to add a slide title. Now we can move on to adding some images. Note the license information and URL and save the pictures to a local folder. Press the button, browse to where you saved the cloudberry flower picture and select it for upload. Finally, we have to add an Alternative text and a Hover text. The Alternative text is used to describe the image as an alternative to being displayed. The Hover text will show up on devices using a mouse when the cursor hovers over the image. Now, add a second picture. 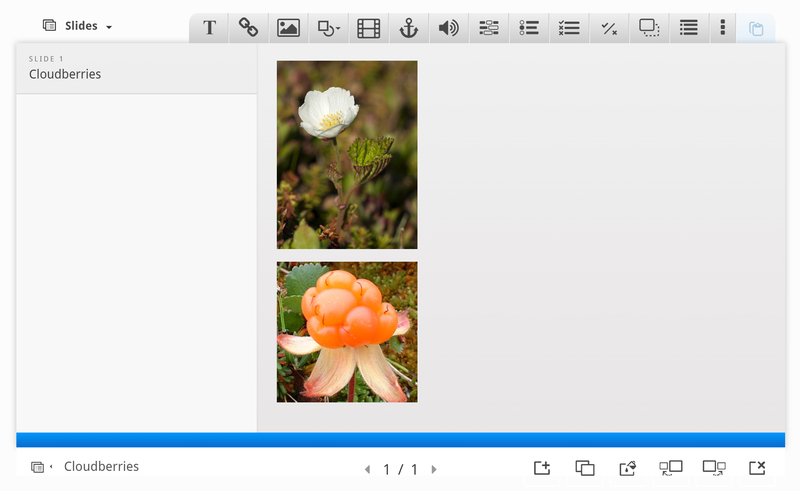 This time, we'll use the cloudberry picture and place it beneath the cloudberry flower picture. Use the same procedure as above. The Rubus chamaemorus is a herb producing amber-colored edible fruit similar to the raspberry or blackberry. The cloudberry grows to 10–25 cm high. The leaves alternate between having 5 and 7 soft, handlike lobes on straight, branchless stalks. After pollination, the white flowers form raspberry-sized berries. Each fruit is initially pale red, ripening into an amber color in early autumn. Leave the other fields blank and press Done. 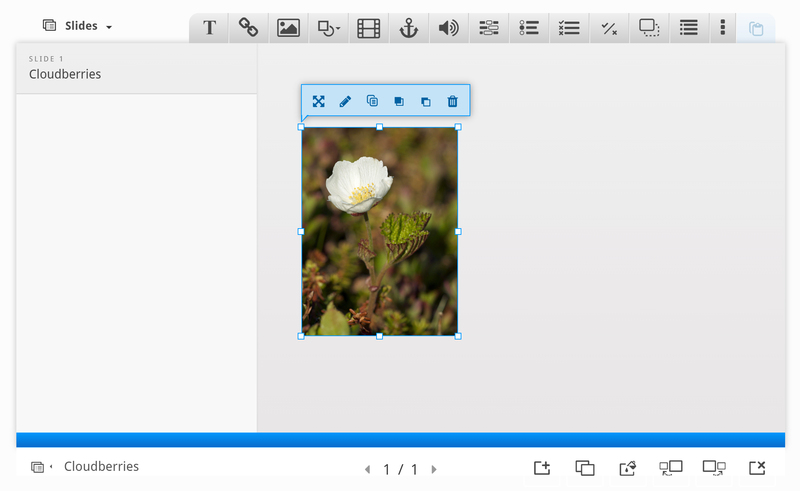 You can place and resize the text block in the same way as images. We have now finished slide 1. Press the button in the lower right corner of the editor to add another slide. Slide 2 will contain information about where Cloudberries can be found. Add the slide title Where to find them? in the slides panel. You can navigate between slides by pressing the slide titles in the slides panel or by using the navigation bar. Press the button to add a third slide. 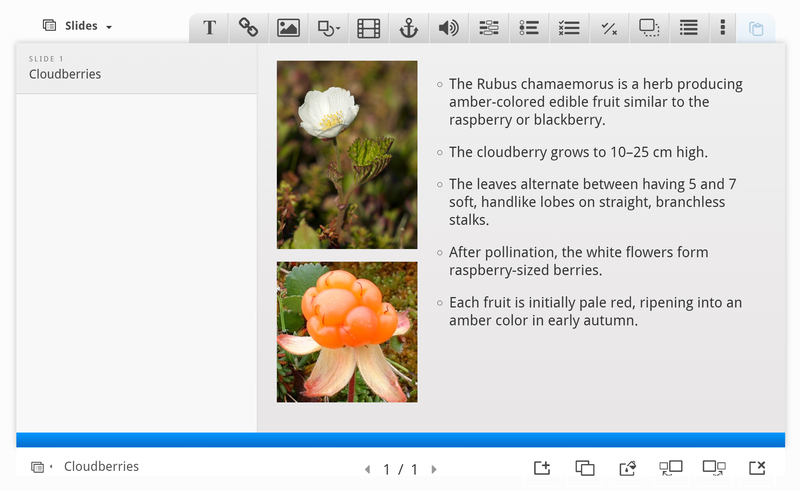 Slide 3 will describe various uses of the cloudberry. Add the slide title Uses in the slides panel. Again, we'll use text and images to deliver our message. In addition, we'll add a link to a website where the learner can find recipes using cloudberries. In Atlantic Canada, cloudberries are used to make "Bakeapple Pie". In Alaska and Northern Canada, the berries are mixed with seal oil, reindeer or caribou fat, and sugar to make "Eskimo Ice Cream" or "Akutaq". Finally, we'll add a link. Use the button on the toolbar and place the link onto the slide. Use the link text Cloudberry dessert recipes. We're now finished with slide 3. Finally, we'll add a Summary to finish the Course presentation. Press the button to add a fourth and final slide. Add the slide title Summary in the slides panel. 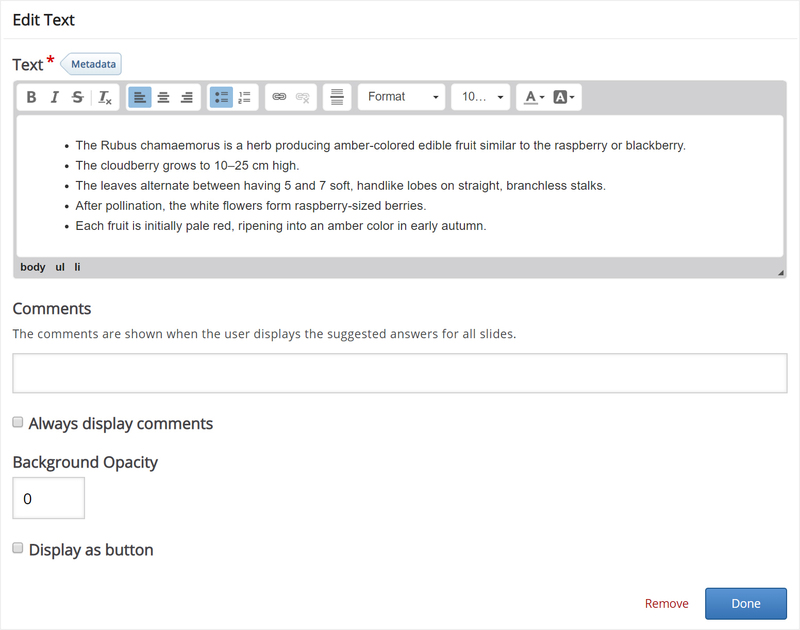 The Summary will allow the learner make an interactive summary of the most important aspects of the previous three slides. 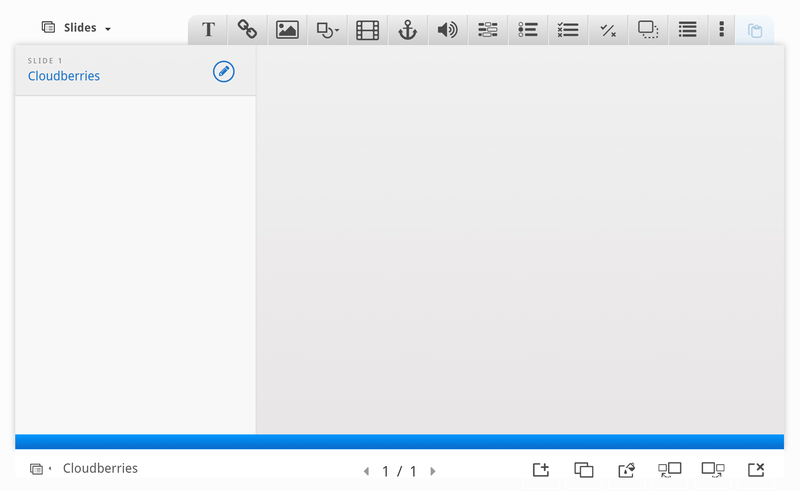 On the toolbar, press the button and drag a summary onto the slide. Creating a Summary is covered in this tutorial. Once you have dropped the Summary, the editor will appear. Now we'll add statements to the Summary. Press the Add statements button to add two more statement groups. In the Summary editor, the top statement in a statement group is always the correct one. Choose the correct statement about Cloudberries. Cloudberries are similar in shape and size to raspberries and blackberries. Cloudberries are similar in shape and size to blueberries and redcurrants. Cloudberries are similar in shape and size to strawberries. Cloudberries are found in the Northern Hemisphere. Cloudberries are found in the Southern Hemisphere. In Atlantic Canada, cloudberries are often used to make "Bakeapple pie". In Atlantic Canada, cloudberries are mainly eaten with a heated local cheese. At the bottom of the editor, you'll find the Enable show solution buttons option. In this context, the option does not have any effect. Save the node/article to view your finished Course presentation. You should now have the same result as the example on top of the page. Feel free to leave any comments or suggestions on how to improve this tutorial. Hello... Really awesome tool. Appericate your great effort. I noticed few more features would make this tool unbeatable. Thanks you for the feedback! #1 is coming up. The other three are noted. I can atleast promise that there will be some new content types soon. I don't know about #2 and #3, but they are good ideas! How about importing PPT presentations? Just wondering if you can import existing powerpoint presentations in this module? That currently isn't possible, and it's not in our roadmap either. To me it sounds like a big job. If we find a quick way to do it we'll consider it. It would be very helpful if this could be added to your road map since many of us already have -elearning courses in ppt and would love to use the tools to enhance rather re-create the entire course from stratch. Hi. I think You have a very good idea here. 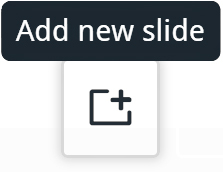 There is an option to export slides as pictures in powerpoint. This can be done in a variety of ways. You have made a slide that You would upload, with all text and images and so on. Just select the objects You would like to have on the slide in H5P. Right click, and choose "Save as image" - use png, gif or jpeg. And then give it a name. The image can then be uploaded to H5P editor. You have a whole presentation ready. Go to File --> Save as and chose the format, jpg, png, gif. Now this time it is wise to make a folder where these images would reside, so they all are in order and are not mixed into other files. When accepting to save, the slides will be saved in that folder, in a numbered fashion, one image per slide.You cold then make slides in the H5P editor, and upload each picture to the desired slide. You could also make an .mp4 file of the presentation, and upload that, if You have a new version of PP. But this normally takes some time with powerpoint, the mp4 making process is rather slow. The mp4 file can then be uploaded to Your YouTube channel, if You have one, and linked in via the video tool, or the mp4 file could be uploaded to the H5P editor. You could make a whole presentation with narration in PP, and then export that too to mp4, with timings, for later import to H5P, via YouTube or direct upload (but the 16 mb limitation could be a problem then). There is a pretty good, free WordPress addon / plugin for making slideshows of uploaded images. Is is called "2J Slideshow for Wordpress". You might want to have a look at https://nb.wordpress.org/plugins/2j-slideshow/, it also has a video describing the use of it. I tried Out the 2J Slideshow, and H5P presentation. A Wordpress page can be composed, where the powerpoint slideshow (made into images in a folder on my PC, and imported to the slideshow in WordPress, and they all turn up in order. There is just some adjustments in the components to do, and then You can copy the shortcode and insert it directly into a new WP page. Now below this slideshow I added the H5P presentation content (also via shortcode). The excercises reside in this component, as H5P content. So the students can now view the slideshow on top of the page, and do excercises in the H5P presentation below. They can view the slideshow at their own individual pace, and also go back and study more if they need while they are doing exercises in the H5P component. Very nice. Have a nice day, and thanks for an eccellent idea. How awesome would that be. I currently have a full -e-learning course in ppt and I just would like to enhance it with H5P tools instead of having to re-create the entire course from stratch. Thank you for the feedback. Will keep track of technologies compatible with H5P's vision that is able to handle PowerPoint files, and also urge people in the community that is interested in this to work together to find a solution. You then have accessibility issues, especially if your slides contain text. The Alt text field could be used to counter this as long as the character limit is not exceeded by the text length. A means to import a slide from PPT woudl be ideal (or even better having H5P as a valid export format for PPT). Without one of these options, you really would best be looking at rebuilding the content, unfortunately. Both accessibility and the ability to import existing PowerPoint slide decks are essential to US public/state funded schools. Converting slides to images is such a step back in terms of accessibility, and so many programs do import slides that it seems like it should be doable. There have been some requests related to this. Although I think no one has taken on the project. What is being done by some community members is to take a screenshot of the slide and upload it in Course Presentation. A quick question: to edit, can I change the depth of objects (which showed on the top of another object). Currently, the one who created first is in the back. Is possible to undo (just one action would be helpful)? How about copy and paste (objects)? Thanks! I agree with all your suggestions. Currently none of them are on the roadmap but we've been discussing those features with one of our customers who hopefully will order at least some of it soon. Hi, This might be a daft question but I cant seem to find an answer elsewhere... How do you change the background colour in a course presentation? Currently you'll have to do it with css. In Drupal you may use hook_h5p_styles_alter to add a css file to coursepresentations. 1. Copyediting - how would that happen within H5P. Can we highlight and comment on any part of the content as part of review. I'm sorry for the late reply. I'm sorry for the late reply. It's due to the eastern holidays. It currently isn't possible to change font color. It will be in a future version. 1. H5P doesn't support this. It is probably possible to add a plugin to your website that makes this possible. 2. H5P supports versioning if the publishing platform supports it. In Drupal for instance you may create several version of an H5P and see the old versions and roll back to older versions. Does this have to be an upload? Standard embedding (e.g. from YouTube) does not seem to work. I can't find this addressed anywhere. I looked through the tutorial, and all I find in the forum hints that it was to be implemented 2015. I am not trying to do interactive videos. Just a simple embed of the video on a page. We support youtube embeds and also external video streams. Just paste in a youtube url into the text field that pops up and it should work. I understand that it is not currently possible to embed an iframe into a presentation through the editor. Are you able to point me in the right direction to hard code an iframe onto a particular slide? There is a summary slide at the end of a presentation showing quiz results. Can we move this slide so that we can add a final slide after the summary of results (if not through the editor, can you point us to the location in the codebase to do this)? I'm sorry you didn't get a faster answer here. I've been away some days and only the forum was monitored while I was away. See Drupal's apis. Please let me know if you're using Wordpress. I would start looking around here. Were you able to get the iframe for a particular slide working? I'm also interested in using an iframe on a particular slide and was wondering if you could help by sharing your method. We are still reviewing this requirement for our project. If it is included and we impliment the feature, we will update this thread with our solution. 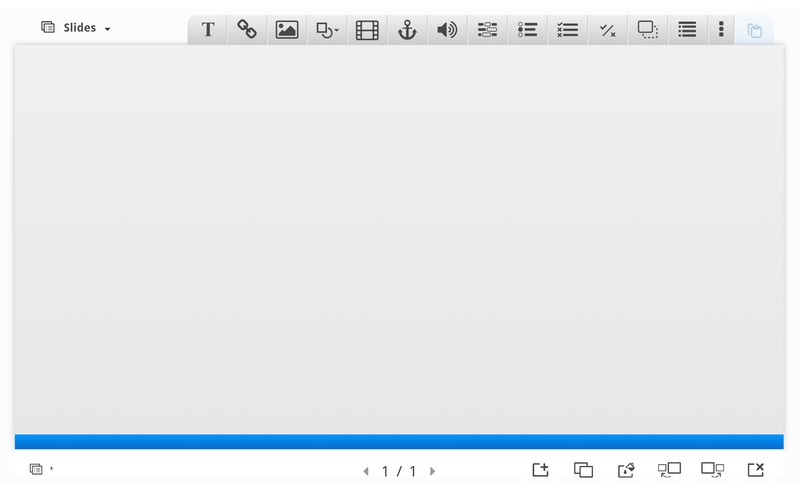 Is it possible to integerate WYSIWYG editor with H5P? Are you thinking that is should be possible to insert H5P inside a wysiwyg text? This is allready the way it is done on WordPress - which CMS are you using? I'm not sure where to put this sort of help request, but I can't find a way to change the stack order of images. I'd like to add a background image after I've already added text. Is there a way to do this once I've already added text? In other slide editors, this is done by holding Ctrl and using the arrow keys, but that doesn't seem to be coded in here yet. Is there a way to do this? Ok, thanks. I'll try the work-around. I still think this thing is pretty sweet! What would your recommend as the optimum image size for 'Course Presentation' without a key words list? How can I get an image to expand across an entire slide? I'm working in a Course Presentation and and having difficulty finding how I can make my image span the entire slide, as yours does in your example on your website. Can you please direct me to where I can find that information? Thank you! P.S. Just starting using H5P and love it so far! The only way is to size the image to fill the slide when you build it. The aspect ration is 1,9753:1 You need to bring the image in with the correct aspect ratio and after that you can drag it slightly bigger if you need to within the H5P with edit turned on..
H5P will automatically resize it for whatever device after that once it is published. Is there a way to import existing H5P content/exercises, etc., into a new Course Presentation? I worked on a couple of drag and drop exercises and an interactive video, but I don't want to have to re-create all the material when I develop a presentation. Is there a way of adding pre-existing content into the presentation? It will be possible to reuse all existing content. At the moment we only support reusing resources between Interactive Videos and Course Presentation. So you may for instance copy(CTRL + C) a fill in the blanks in an interactive video and paste (CTRL + V) it into a course presentation. Hi. have you added a feature that lets you reuse content yet? No that feature is not in place yet. I'm trying to copy some content from one slide into another (within same course presentation) using Comand + C / Command + V (in a Mac) but it is not working. I select the content and use the short keys but nothing comes up :/ Any ideas as to why this could be? Did you try to use the Ctrl key instead of Cmd? Ah yes! it's working now! Is it possible to remove the grey audio icon from a single choice question set within a course presentation? If so, how? Single Choice Set has a checkbox named Enable sound effects. If you uncheck this, no sound will be played and the audio icon won't be displayed. Is this what you want? Please how to associate audio on "audio icon" in single choice set within course presentation. I am not sure if I understand your question correctly. What do you mean with "associate"? I wanted to recorder the voice that can be directly link on "audio icon" in single choice set within course presentation. That's not yet possible, unfortunately. We already have a plan ready to implement that feature, but it has low priority. You can check progress at https://h5ptechnology.atlassian.net/browse/HFP-1145.